When you ask the question ‘what can be done with a laser cutting system’ you open up a world of possibilities that, only a few short years ago, were only to be found in the realm of science fiction. The simple fact is that most laser cutting machine being sold today are powerful enough and precise enough to cut a wide variety of substrates into an even wider variety of shapes and sizes that have tolerances that are off the charts. 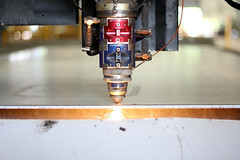 Garcross Limited a UK company have invested heavily in the industrial potential of laser cutting. For example, if you’re a high school shop teacher and you have a laser cutting machine you can allow your students to create an incredible variety of objects that can actually be used. Form instruments to paperweights and everything in between it’s like wood shop 30 years ago but with a magic cutting machine that has a finish so fine and edges so clean you’ll think it was custom moulded, not cut. If you’re a hobbyist and you want to create custom action figures you can make the actual pieces that you need, like arms and legs and feet and heads, that are so precise you’ll think they were made in Taiwan. Chess pieces, instruments made out of cardboard and laser etched gifts are easy and quick to make when you have a laser cutting system handy. If you have a mechanic shop where you fix cars, motorcycle and other gas powered vehicles a laser cutting machine can give you the ability to cut custom or replacement parts easily and in-shop. On the hit TV show ‘Tanked’ the people who make custom fish tanks sometimes use a laser to make the intricate cuts that they need for a custom acrylic fish tank and on many of the car and motorcycle customizing shows they use laser cutters to make custom car and motorcycle parts all the time. A designer who wants to see if their newest lampshade will look and hang the way they like can cut one out of cardboard first with a laser cutter to see if their design is good or has flaws, and someone who has access to a laser cutter can start a business laser cutting tchotchkes and engraved goods that they can sell to the public that are absolutely beautiful and precise , including etching faces and other intricate details onto mugs, plaques, wallets and so forth. The truth is that there are so many things that can be done with a laser printer system that trying to list them all would be pointless. It seems as if every day someone discovers a new use for them and, as the price of laser cutting systems drops, you can be sure that there will be much more uses found for them in the very near future. Kicking the Wires: What Makes a Cloud Web Host Reliable?